Do you run the Jarvee or self-developed Instagram bot to engage numerous IG accounts? One of the most factor for Instagram automation it the “Proxies”! This Post I would like to share our experience with Instagram proxies to help you out! You’ve finally decided to tap into the great traffic source of Instagram. Smart decision, people who aren’t using the Instagram platform are missing out on one of the internet biggest traffic sources. Today I will be showing you the ultimate guide for using proxies on Instagram. 1 Why should you use Instagram as a traffic source? 2 What are the top 5 Instagram proxies? 3 Whats the best Instagram automation tool? 4.1 How does the method work? 5 Things to do before starting your Instagram journey. 5.1 Why do we need to use proxies for Instagram? 5.2 Where to learn more about this type of stuff? Why should you use Instagram as a traffic source? This is because Instagram has 350+ million monthly active users. It would be hard to not use this platform correctly. Another great thing about it is if you use any sort of automation. You really start to get a lot of free quality traffic. Any business owner not tapping into Instagram traffic source is missing out for sure. Instagram is great for many things that increase sales. Brand awareness is important in any marketing campaign. Instagram gives the chance for any average person to get hundreds of accounts, and start gathering 1000s of clicks. What are the top 5 Instagram proxies? When starting your Instagram journey you just can’t pick any proxies. You want private proxies that are only used by you. This is because normally proxy companies share them out to other customers. This is a red flag for Instagram and will give you a higher ban rate. These proxies come at a higher price compared to their competitors. With a cost of around $2 per private proxy would really hurt the bank. They have good quality proxies though, and you are getting every pennies worth. You can Read more about their proxies on HighProxies Service Detail. Definitely a more expensive choice but by user reviews, it looks like it money well spent. With 25 Instagram proxies costing an enormous amount of $96 monthly. You would think they wouldn’t make any sales. Surprising they have a great reputation and a huge client base. Check our review about the SSLprivateproxy, Do their proxies work on Instagram? Paying $1 per private proxy is one of the greatest deals. Instantproxies is consistent with their quality, have a great reputation, and ease of ordering. I’ve personally used their proxies for months on a couple of Instagram projects. Instantproxies are the best cheap Instagram proxies from our test! Read our review to know more detail about their proxies. A company is known on all marketing forums but the sad part is the cost. 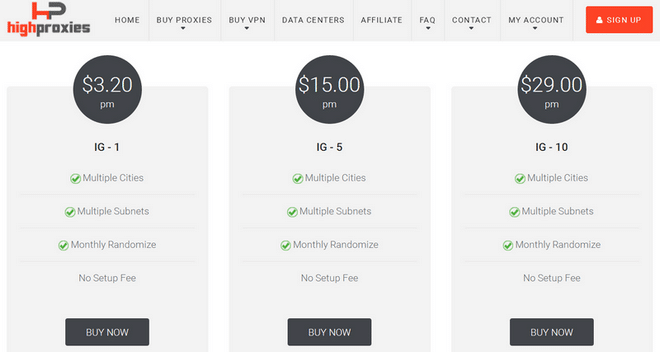 Their is competitors that offer cheaper proxies, and have the same or better quality. Depending on how much proxies you get, when you get 10 proxies. That would cost you $24, but when you buy 2000 it cost only $1500. You can Read more about their proxies on SquidProxies Service Detail. Generally, one of the more expensive options, but not as expensive of some of its competitors. On average paying, up to $2 per private proxy would hurt and give any marketer stress on making back that money. Their quality is still great nonetheless, so don’t worry about spending money on low quality. 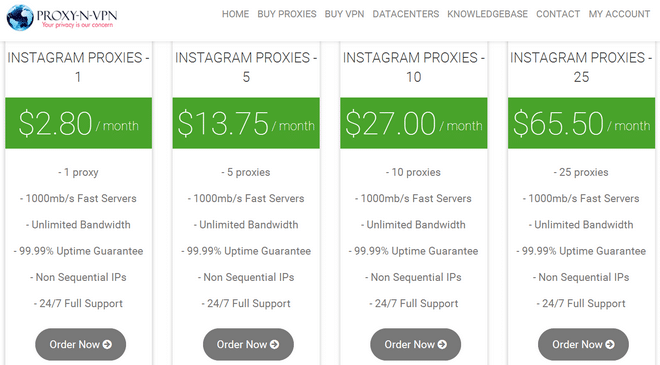 To know more about Proxy-n-vpn, you can read our review that tested their proxies on Instagram. Whats the best Instagram automation tool? There are many tools out there that will help the process more. Without using automation you are behind the curve and missing out on traffic. It is impossible to manual gather traffic off Instagram and makes it worthwhile. This is why we have Instagram bots to do these mind-numbing task automatically. This bot has a huge reputation in many marketing forums and for a good reason too. They are known as the most stable and feature-rich automation tool. Costing $97.99-lifetime fee and on top of that $5.99 per month. This bot is comparable to the old mass planner, and mass planner was one of the greatest automation tools. You could either pay $9.95 per month or $79.95 annually. Gramdomintor isn’t as feature rich as follow liker. It still has all necessary features required to run CPA spam projects. There is a promising developing team behind the product. It looks like it has the potential to be the next mass planner. This bot costing at $19.99 per month, $49.99 for 3 months, $89.99 per 6 months, and $149.99 per year. This bot is on par with followliker and has potential to take over the automation game. This bot for its price it’s still feature rich and I have a nothing but good thoughts. The company behind this bot is still at its start-up stage but I believe it has a chance to take over. Costing per day is $1.79, 3 days is $4,99, 7 days is $10.99, 30 days is $39.99, 60 days is $64.99, and 90 days is $89.99. Gramista is a very stable bot with many features and also comparable to gramdomintor. The pricing system throws me off and is pretty inconvenient. Although, it has all necessary features for an average Instagram campaign. Costing per day at $2.99, 3 days is $7.99, 7 days is $17.99, 14 days is $34.99, 21 days is $49.99, and 30 days is $59.99. This is also comparable to Gramista but just more expensive. Also, pricing throws me off and show be more simple, like gram dominator. Here is a very popular method i will be showing you in this article. The reason why proxies or automation is required because it would be impossible to do by hand. This method is known by Instagram spam, also known as, Instagram CPA or CPI. You get a user on Instagram to install an app and you get paid for it. That’s all to it basically and people are making thousands daily from this method. The only way to make this method worthwhile is by having multiple accounts. Instagram also bans spam accounts so you must always be adding accounts. The first thing you do is purchase any Instagram automation tool, private proxies, and sim cards. You may or may not need a VPS if you decide you can’t run the program 24/7. Next step is to set up either 1 or 2 IG acc per private proxy. Customize the bio to lead up to whatever offer you’re promoting. Then start to follow users, and that’s all basically. The more accounts you have running the more money you make. That is the basic template of how IG spam accounts operate and make money. Next, i will show you how another group of marketers is making money with IG. This method involves creating high-quality accounts and posting valuable content. This, in turn, gives you a loyal fan base and engaged visitors. Once you have around 10k followers on IG this is when you could either, sell your own products, or sell shoutouts. Its easier to sell a couple shoutouts a day across accounts. If you have 10 accounts with 10k followers per account. You can sell shoutouts at $5 a piece all you need is 1 shoutout across all accounts per day to make $50. This method is popular because these accounts normally last way longer than spam accounts. Instagram is a popular platform for marketers because the sky is the limit. Nothing is stopping you from creating 100s or 1000s of accounts. Instagram traffic is popular because it makes people around the world so much money. Things to do before starting your Instagram journey. When starting either a spam or legit Instagram campaign. You have to be careful on how you run the accounts. It is impossible to go full blast the first day of using the accounts. You must use low settings with the Instagram bots and slowly increase settings. For example, you follow 10 people the first day, 30 people the third day, 50 people the fifth day, 100 people the seventh day, 200 people ninth day, etc. You slowly increase and follow on average 600 people per day. Make sure to tweak your automation settings to look as human as possible. For example, random breaks, not contently following, too much liking in short period time, etc. The best ways to make sure your accounts survive the longest is looking human.Once you start to get the hang of how everything works than profits start to roll in. Why do we need to use proxies for Instagram? To put it simply its because we don’t want Instagram to connect the dots and ban all our accounts. This is why we use proxies, to look like we come from a different place. It would be impossible for anyone to use 1 IP address for 100s of Instagram accounts, but it is possible to have 50 proxies for 100 Instagram accounts. Where to learn more about this type of stuff? Blackhatworld is one of the greatest marketing resources online. It taught me all the information I’m laying out to you right now. It also has a marketplace to find all the necessary items for pulling off a successful Instagram campaign. Considering joining that forum it has information to find all the best proxies and money making methods. Once joining that forum you will understand the amount of potential Instagram has to make a full-time living. To sum it all up the best proxies price and quality wise from this list would be instantproxies.com. They have consistently kept their servers up and running and had no issues with using them. They beat all competitors on that list simply by the price and the quality is better than most on the list. Where can I find residential proxies to use for non spam instagram accounts? From my understanding, rotating residential proxies will harm the accounts…? The dedicated proxies for instagram accounts will be fine， the rotating residential proxies are not good for the accounts for the IP address is changing all the time. I have used both Smartproxy and Luminati rotating residential ones and they worked quite great. It should do harm if your IP is jumping all over the continent. I have set my IP addresses to be rotated only from one city – no bans since then. Hello, do you know any company that offers proxies in Latin America? Thank you. I know both the limeproxies and blazingseollc offer the proxies which located in Brazil. I was wondering what’s the best proxy nowadays as the PVs are getting real! I check a guy recently uploaded a video saying SSL are working well. Can anyone confirm SSL proxies are worth getting for instagram today? Yes,SSL private proxies still one of the good proxies provider for IG. We are still using SSL proxies and you can check our review and test to their proxies, all of their proxies are 100% passed the test on Instagram. Hi! I manage several instagram accounts manually from my phone and use a bot for a few of them (about 20). Do I need to use proxies for posting from my phone on the accounts as well? If Only several instagram accounts, that’s no need to use, especially you use on your moblie device. But if you use the Bot, I advise you use the proxies. The best is one proxy per account, No more than 3 accounts on one proxy!